The molecular reaction of living cells, organisms or microbial communities to external stressors leads from an initializing event via alterations in signalling pathways to a decision on whether the system can cope adequately with the stress or not. Little is known about the individual steps in this process and knowledge is even sparser on the regulation of interactions between the different layers. There is a great need for mechanistic insight on the pathway and regulatory level since only that will provide the foundations for predictions. State-of-the-art mass spectrometry is used to assess the effective exposure. Therefore it is possible to detect a wide range of xenobiotics and pharmaceuticals in various matrices. The Department of Molecular Systems Biology (MOLSYB) also maintains the proteomics/metabolomics platform PROMETHEUS. Its capacity includes the following techniques (1) quantitative assessment of xenobiotics in human cohorts, (2) screening for xenobiotics in fat tissue and cells and (3) profiling of xenobiotics in microbial communities. The effects of xenobiotics are characterised most often by the following proteomic and metabolomic means: (1) quantitative global proteomics (SILAQ, TMT, LFQ), (2) targeted quantification of selected proteins (SRM), (3) protein stable isotope probing (Protein-SIP) for analysing the structure and function of microbial communities, (4) global quantification of post-translational modifications and protein-protein-interactions, (5) global profiling of endogenous metabolites in serum, urine and cellular extracts and (6) quantification and flux analysis of selected key metabolites. The molecular data is transformed by bioinformatic tools into biological information and then correlated with other information on the analysed model system. We provide insight into the effects of xenobiotics on the systemic molecular and regulatory level in model systems. The detected processes are grouped into classes of regulation depending on the initiating stressor. The knowledge on pathway level will help to improve the risk assessment for the corresponding xenobiotics. The analyses in different model systems also allows a cross-species comparison and risk assessment. The development of preventative measures using knowledge-based information is of specific interest. 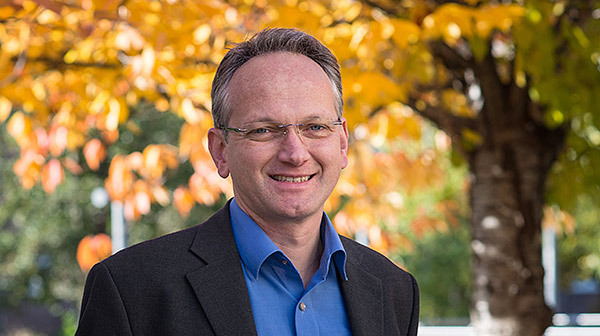 Professor von Bergen is a biologist and Head of the Department of Molecular Systems Biology at the UFZ in Leipzig. He is co-spokesperson for the "Exposome" Integrated Project in the Helmholtz "Terrestrial Environment" programme. His research expertise is in the impact of environmental pollution on cells in the human immune system, the identification and characterisation of allergens and in proteomic and metabolomic techniques as an approach to systems biology which is also applied to questions in microbial ecology and biodegradation. This research is closely linked to the Helmholtz research field "Health" through the "Environmental Health" programme. In 2015 Professor von Bergen was awarded the Waters Prize for Mass Spectrometry in the Biosciences. Since November 2015 he holds a chair for "Functional Proteome Analytics” at the University of Leipzig (Institute for Biochemistry) in a joint appointment with the UFZ.